This was all baked in the same oven, at the same time, using the oven for 30 minutes, total. I've been using my toaster oven and microwave for most of my oven needs this summer. But when I need to do a major baking, like a 5-loaf batch of sandwich bread, I use the main oven. And I bake up most of the week's breads, muffins, cakes and pies, at the same time. I have a good old-fashioned, Little House-style, baking day. Back when women baked with wood or coal for fuel, having a baking day was the efficient use of the stove. A cast iron stove can retain heat for a long time, meaning that if one were to bake a batch of bread, they might as well take advantage of the residual heat and bake for several hours. It is work to get a wood or coal fire up to the right temperature for baking. While a joint of meat can roast at any temperature between 275 and 400 degrees, and the temperature can fluctuate throughout the baking period without significant undesired effect, a pie or loaf of bread, really does need consistent, even and moderate heat. Baking days fell out of favor when women were fortunate enough to step into the age of electric and gas ovens. With electricity or gas, a precise temperature for baking could be effortlessly dialed up and ready to go, in a matter of minutes. It became possible to bake any or every day of the week. While no longer necessary, baking days can still be beneficial. You can bake a week's worth of items in one day. You can use your energy with efficiency, by getting out the mixer, and ingredients all in one go. 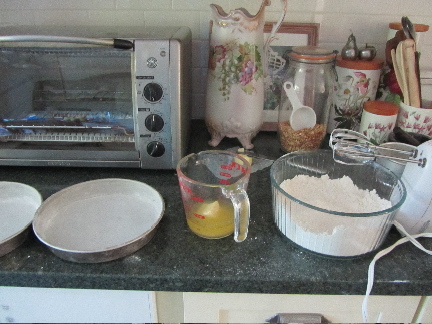 I typically begin measuring into different bowls, all in a line, for the various items that I'm baking. 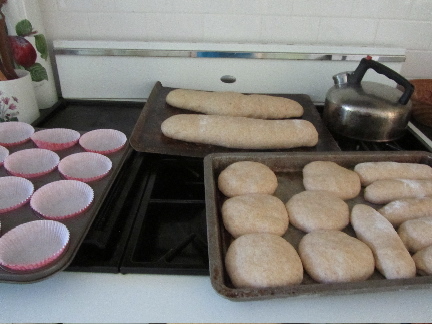 For some items, I mix up a large batch of yeast dough, to divide into portions for different types of breads and buns. And, if you max out your oven's capacity, you can save electricity, by preheating once, and loading up the oven for one baking period. Here's how I make sure that my oven is maxxed out. 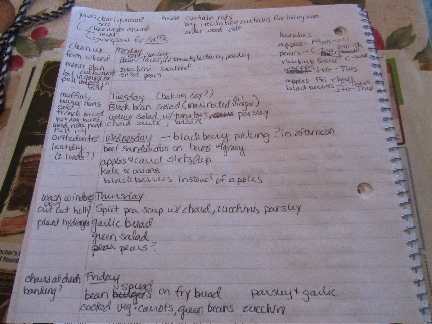 I look over my menu plan for the week and see what will need baking, and that can go into the oven at the same temperature, more or less. 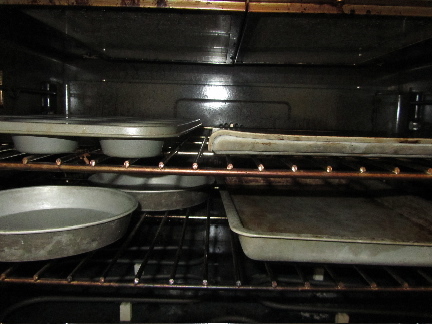 As my yeast dough is mixing in the KitchenAid, I open the oven and place inside, the various baking pans that I'll be using. 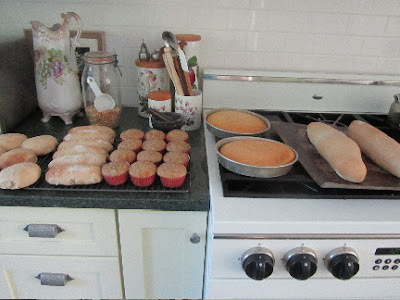 Here you can see I have a muffin tin (for zucchini muffins), a large baking sheet (for 1 loaf of Savory Rosemary Bread and 1 loaf of French bread to use for garlic bread later in the week), and a jelly roll pan (for burger/sandwich buns and hot dog buns). I have an open space on the bottom rack. That's when I go back to my menu, to see what might also fit in the oven. Aha! A cake! I am needing a cake for the freezer anyways (for those cake emergencies, of course!). So I decide to bake 2 round layers of yellow cake. If I turn my jelly roll pan the long way, I can fit two cake rounds on the left side of the bottom rack. I've now maxxed out my oven for one 30-minute baking period. The suggested baking temperatures for the items range from 325 to 375 (convection). I settle on 335, so that the most delicate of the baking (the cakes) can have a temperature close to ideal. The rest of the items can be more forgiving. 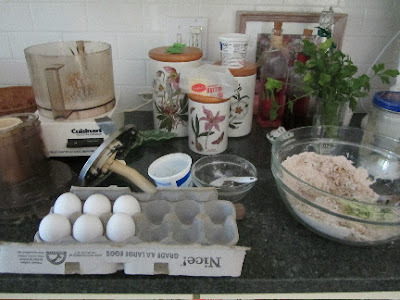 As the yeast dough rises, I prepare my quick breads and cakes. I time the addition of liquids to these quick breads/cakes to the yeast bread's rise. When it looks like the yeasted bread will be ready soon for the oven. I preheat the oven, and quickly finish up the cake and muffin batter, and into the pans. I load up the oven, and set the timers. I have 3 timers in the kitchen. I set all three, timed to different items. To keep it clear which timer is for which item, I place the recipe card or cookbook next to that timer. I had the oven on for 30 minutes, total, costing about 7 cents in electricity. I removed items as they finished baking. The last item to remain in the oven was the sheet pan of Savory Rosemary Bread and French bread. It looked like it needed an additional 4-5 minutes. So I shut off the oven, and let the bread continue baking in the still hot, but not on, oven, for those additional minutes. Had I used this oven to do the same baking, but on different days, preheating the oven individually, as many as 6 times, and baking each product separately, it could have cost as much as 42 cents in electricity, to bake the same foods. I might have used my smaller wall oven, at 11 cents per hour, or 33 cents of electricity, total for the week. Or, perhaps I would have used my toaster oven, on several days. As I can't get more than 1 layer of cake, or 6 muffins, in there at a time, I might have baked in the toaster oven for a total of eight 30-minute time periods, for a cost of 12 cents in electricity, not including several (6) preheating time periods. In any case, I saved electricity and hard-earned money. And my motto is, "money we save, is money we don't have to earn, no matter how small the amount." Franklin's phrase is catchier, but mine gets the point home to family members, loud and clear. One of my mom's old cookbooks (from 1957) recommends using your oven efficiently in this same manner. They suggest making an oven dinner, where all the components of dinner are baked in the oven at the same time. Here's an example of one of their oven meal suggestions. Using 2 racks in a full-sized oven, twin meat loaves in a shallow pan, carrots in a covered casserole, baked beans in an open casserole, potato halves in a shallow baker, and baked apples in an open casserole. Everything in this menu is baked at 350 degrees F, for 1 hour. If I know ahead that I will want to use the oven for a couple of items for dinner, I will also postpone any baking until dinner prep time. And I'll consider what else could fit into the oven, to get the most from it's heat, sometimes a baked dessert, and another component of the dinner which I normally cook on the stove top (like vegetables), and often times tossing in a few whole potatoes, to bake with everything else. Those baked potatoes can be the backbone for a simple supper of hash, the next night, or added to take away lunches the next day, or enjoyed with breakfast, in lieu of toast. There's a side benefit to having a baking day, or making an oven meal -- saving time. I spent 30 minutes watching the ovens on this latest baking day, instead of of potentially 3-4 hours over the course of the week. And I had just one big clean-up, instead of needing to sweep up the scattered flour and sugar several days of the week. When making an oven meal, I put it all in the oven, set the timer, and I am free to catch up on the news, fold laundry, spiff myself up, or chat with family. No standing at the stove, stirring a pot and getting hot. Just for fun, I thought you'd like to see that my kitchen gets messy, too. Half way through it all . . . I love to do a baking day. I have found that it is easier to do it all at once and I am less likely to vary from the menu if I already have the bread made up. My mama's version of the oven meal was always meatloaf, au gratin potatoes and peas. As they were almost done she would put in a pan of biscuits or cornbread. Yes, I think you're right. Having part of dinner all ready made does spur me on to finish out that day's menu, and keeps me on track using up what needs eating. You mention a convection oven. Do you have one because from my experience, I can't bake that many bread cake type things at once because there is not enough air circulating around the items and some of them are too close to the burners. However, the meatloaf, carrots, etc. work fine. But, I haven't worked on it as much as you have so maybe I just need more practice. Also, a comment on cast iron wood burning stoves. My grandmother had one and even after she got her electric range, she still used the oven part of the wood burning stove. She said that it baked better. My main oven (part of the range) is convection, my wall oven is not. I haven't experienced too many problems with large baking in either one. When I'm baking 5 loaves of sandwich bread at a time, they're pretty squeezed into the smaller wall oven (not convection), with about 1/2 inch between each pan and 1 to 2 inches between pans and walls. And they turn out fine. I do use insulated baking pans. I know they have fallen out of favor recently, but I love mine. I can put rolls on a bottom rack and the bottoms of rolls don't burn. I sometimes (but not always) shuffle items around during baking, moving top to bottom rack. My oven has a hot spot that I have to be careful of. I just place the items that need a higher temp in that spot. At least the oven meals work for your oven! I measured the placement of my racks from the other day. 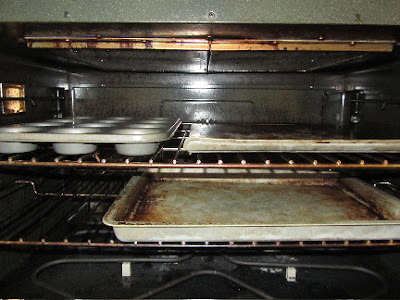 The bottom rack is 5 inches from the floor of the oven, the 2 racks are 4 inches apart, and the top rack is about 7 inches from the top of the oven. I believe I had a couple of inches between pans, and pans and walls. I sometimes move the racks around, but this is their usual placement. The convection fan is in the back. And like I said, I have a hot spot, and try to remember not to place delicate items there, but that spot is great for things that could benefit by more heat. I sometimes have tops of buns or breads that don't brown perfectly, because of a blocking pan. But we're fine with that. However, I've found a blocking pan can be a good thing. One oven tends to overbrown the bottom of loaves of bread. If I place a jelly roll pan of something like granola on the bottom rack, beneath the loaves, the granola pan seems to block some of the intense heat from the bottom element. Again, don't know if any of this helps. I figured that you had worked on making this work. Insulated pans make sense. Why have they fallen out of favor? I don't know why, exactly. But I've seen others' comments on other blogs/sites that they don't like their insulated bakeware, that they don't work as well as they're supposed to, and they do warp. But for me, I do like them, and they save my cookies every time. It seems that a lot of people want commercial-grade baking pans, and are willing to spend a lot of money on them. I've had the same insulated ones for 20 years, and I don't see myself replacing them any time soon. I think this is an old time skill that makes sense! Saves money, saves time, and better for the environment. We can learn a lot by looking at how things were done in the past. I'm very grateful for the advances that we do have, but sometimes, as you say, it just makes good sense to do things the old time way. Wow. I'm not sure I'd get everything timed out correctly to bake all at once like you did. My hat is off to you! I was interested to see that you didn't use bread pans for your loaves of bread. And I liked your explanation of "baking day" using a wood stove. Makes sense! I use loaf pans for sandwich bread, but just a baking sheet for French bread or artisan-style bread (I love that my very rustic bread now has a fancy title -- it's Artisan! ).